Have You Ever Thought About Teaching in Kuwait? If you are looking for something a little different, teaching and living in Kuwait might be for you! Most schools in Kuwait are public schools which use the Arabic language for teaching. But there are an increasing number of international schools which include American, British, and French, bilingual schools, and other private schools. The increase of international schools is due partially to the country’s popularity for international work and travel since the Gulf War. In fact, foreign residents now outnumber native Kuwaitis 2-1. 35% of the population is made up of people from surrounding Middle Eastern nations (Egypt, Jordan, Lebanon, Oman, Palestine, Saudi Arabia, and Yemen), 9% of the population is Indian, 4% Iranian, and 7% foreign nationals. 60% of the population is male and 40% is female. Regarding schooling for Kuwaitis, it is free with mandatory attendance for children until fourteen. Most schools are segregated according to gender. Interestingly, there is only one university in the country. But since education is highly valued, the government gives many scholarships to Kuwaitis for higher education. There are also several post-secondary technical institutes in Kuwait. No wonder, 79 percent of the population is over the age of 15 and are literate. Modern-day Kuwaitis are the descendants of the nomadic tribes and clans who settled on the coast of the Arabian Gulf during the eighteenth century. They built forts to protect themselves from other nomadic tribes. The name Kuwait comes from kut, an Arabic word for “a fort”. Located at the northern end of the Arabian Gulf, Kuwait is very hot and dry with a mostly flat landscape. November through April is a little cooler and there may be some rain. The summer months are extremely hot, but you can expect the humidity to be lower than most other Gulf countries. Sandstorms can occur at any time but are more prevalent in June and July. This small country (about 2.4 million people) owns 10% of the world’s oil reserves. It is extremely wealthy with high-rise apartments and expensive automobiles a common site. Many people live in urban areas because of the abundance of scarce resources in the desert. Only 5 percent of the land is suitable for farming so Kuwait is dependent on international trade for food, clothing, and construction materials. Their religion is predominantly Islamic; approximately 85 percent of the population is Muslim. There are two main sub-sects of Islam in Kuwait with 45 percent of the population Sunni Muslim and about 40 percent of the population Shi’a Muslim. The remaining 15 percent of the population practices Christianity, Hinduism, Parsi, and other religions. As Kuwait is predominantly an Islamic country, alcohol is illegal. There is a fasting month of Ramadan with practitioners of Islam not eating between sunrise and sunset. Also at this time, the consumption of food, drink, and tobacco in public is forbidden. For practitioners, the most essential aspect of Islam is the purification of the soul through prayers five times a day, known as assalat. Like many other Middle Eastern societies, family is important with extended families living together. This helps to maintain both familial and cultural traditions. Most marriages are arranged; intermarriage happens within clans but not between social classes. Women need their father’s permission to marry and they must marry a Muslim. Women have only one spouse, but a man has the legal right to have four wives and the wives do not need to be Muslim. Long-sleeved shirts and long pants for men is suitable everywhere in the country. Short sleeves are acceptable in informal settings like shopping or sightseeing. Women must dress modestly in elbow-length to long sleeves with skirts and dresses below their knees or they can wear slacks. Many Kuwaiti women still wear veils and traditional black, but younger Kuwaiti women like to follow western fashion. It has been noted that today, more and more women are seeking job opportunities, acceptance of women’s rights, and the relaxation of social restrictions. Recreation is a highlight of the country. There are many public beaches lining the coast. You can try scuba diving at a local dive center or sport fishing at a nearby marina. Speedboats can also be rented by the hour. An indoor ice skating rink is located near the center of Kuwait City. Its museums, ruins, markets, malls, restaurants, and entertainment centers with cinemas and games for teens and children offer something for everyone. The country prides itself on its Persian carpets, leatherware, silverware, inlaid wooden backgammon sets, opal jewelry, and copperware. Although bargaining is customary in most Middle Eastern countries, it is not a common practice in Kuwait. There is little nightlife (alcohol is usually not available) and no commercialized tourist scene. That means there are limited tour buses and tourist advertising, brochures, and maps. Many attractions and facilities are set up to appeal to the local population. For example, admission to most museums is free. There are numerous interesting places to visit as well: the largest aquarium in the Middle East is at the Scientific Center, just east of the city center; the largest wooden ship in the world is permanently dry-docked at the Radisson Hotel, southeast of Kuwait City. Most museums and businesses close for a long siesta from 12-4 p.m. daily with Fridays as a day off. Most North American fast food restaurants can be found in Kuwait, but Indian restaurants serving the local population are the most inexpensive to eat at with traditional, spicy foods the usual fare (pita-type bread, prawn, yogurt, and fish dishes). Additionally, there are many upscale restaurants with family sections. Solitary men are not seated in the family sections, but solitary women are welcome. Deluxe hotels offer a great variety of foods (Indian, Chinese, French, and Arabic), although they are more expensive than the traditional foods. Taxes are usually included in all menu prices. Tipping is expected at upscale restaurants. The airport (Kuwait International) is 10 miles/16 kilometers south of Kuwait City. it is a large, modern airport. Inexpensive bus shuttles frequently travel from the airport downtown or you can take a taxi (designated as such with a red license plate). Agree on the price ahead of time. It is not customary to tip the taxi drivers. Long-distance taxis can connect you to Saudi Arabia at a reasonable rate (make sure you have a visa for Saudi Arabia before entering the country). You can also travel via a chauffeured car. Auto-lease cars are available from most hotels. You will pay for a driver and a car for trips within Kuwait City. Expect to pay 35 KWD (about $115 U.S.) for eight hours/3 passengers. Areas outside the city have an additional fee. On Fridays and holidays, the charge is often more. There are rental car companies at the airport. However, you need an international driver’s license and private insurance to drive in Kuwait. Expect traffic jams and probably more reckless driving than you are used to back home. Despite its history of war, Kuwait is now a very safe country to live and work in. The laws in Kuwait are very strict, so Kuwaiti citizens generally obey them. Street crime and theft seldom occur, although women may expect some harassment. Women should not go out unaccompanied after dark and not even alone in a taxi. You will notice tight security at upmarket hotels used by international business travelers and tourists. Outside of the security presence at these hotels, there is a relaxed atmosphere everywhere else in the country. You should not travel off the paved roads without a local guide as there could be potential danger in some areas despite the unexploded mines being cleared years ago. The military zone along the Iraqi border is closed to the public. Mostly, Kuwaitis sit, talk, and stand closer to each other than Westerners are used to. Socially, physical contact between men and women is not acceptable. Public telephones, although not too common in Kuwait, need a local telephone card. These cards are valued at 1-3 KWD (1 KWD = $3.28 U.S.; 1 Canadian dollar = .73 U.S.) and are sold at convenience stores. They can be used for local and international calls. Cell phones need a SIM card that you can purchase at the airport; you can purchase a cell phone there, too. There is an internet cafe, the Princess Diana Internet Cafe, open 9 a.m.-11:30 p.m. daily in the mall behind the Kuwait Airways’ office. Access cost is 500 fils/an hour (about $1.15 U.S.). The main post office in the city guarantees delivery to North America in three days. The daily newspapers include the Arab Times, the Kuwait Times, and the Daily Star with the International Herald Tribune. Kuwait Zoom is a free monthly tourist magazine that lists things to do and see. There are ample reputable medical and dental facilities that provide preventative medicine and good quality care if you should become sick. You should discuss with your doctor about hepatitis and typhoid vaccinations before coming to Kuwait. While in Kuwait, it is advised that you wear sunscreen and a hat to shield yourself from the hot sun. The drinking water is fine, but if you are skeptical, you can always buy bottled water or drink a boiled beverage. Citizens of the U.S. and Canada need passports and visas. You can purchase a visa at the Kuwait Airport for a fee if you don’t purchase one before you arrive. If you have documents showing either recent or planned travel to Israel, you will be denied entry into Kuwait. 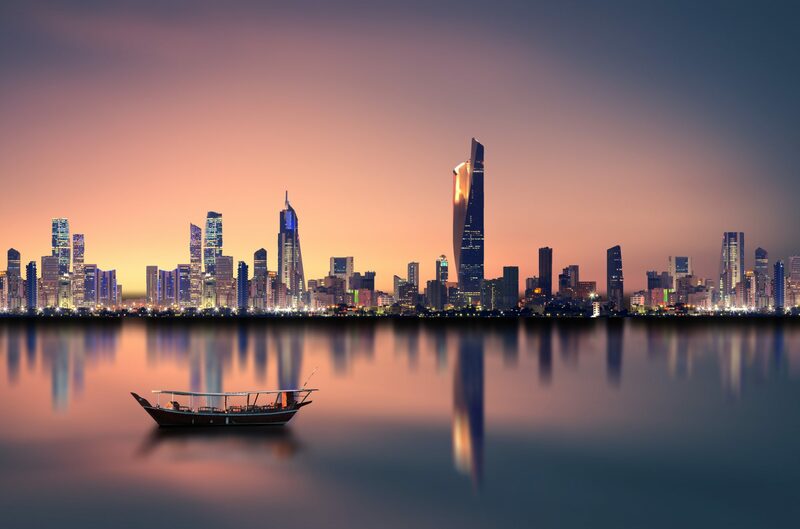 Regarding currency, U.S. dollars are easily changed back and forth without a fee at the exchange offices at the airport as well as in the businesses throughout Kuwait City. You don’t need to show a passport to exchange money. It is difficult to use travelers checks so you should avoid these. However, ATMs are available. Banking hours are Sunday-Thursday from 8-1 p.m. There is both a U.S. Embassy (Embassy of the State of Kuwait, 2940 Tilden St., Washington, DC Phone 202-338-0211) and Canadian Embassy (Embassy of Kuwait, 333 Sussex Drive, Ottawa, ON K1N 1J9 Phone 613-780-9999 or go to: http://www.embassyofkuwait.ca. ).